Welcome to the Lancaster University Revue Group historical archive. LURG was a student comedy society, active between 1976 and 1991. The site is dedicated to collecting and preserving the wealth of memorabilia associated with the Group and to documenting the many productions it mounted. Return of the Scrapbooks ! 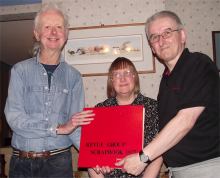 Three of the Group's scrapbooks, from 1976/77 and the early 1980s have been rediscovered, providing a rich seam of new material for this site. Read more on the new Scrapbooks page. Details of newly added photos, memorabilia, facts and articles can be found on the Recent Additions page. The picture on the left shows the ceremonial handover, on 24/Aug/2018, attended by Tim, Linda and Lawson. The ceremony was declared quorate based on the presence of two presidents, one vice president and three producers. In addition to the injection of material from the scrapbooks, the site now also includes a major new sketch database. This attempts to document as many as possible of the individual sketches from LURG's various productions. The database includes details of writers and performers, plus many original scripts and links to audio, where available. Contributions of missing information, scripts or running orders are all welcome. Very sorry to report the passing of Ray Winter (15/Jan/2018) and Patrick Burton (12/Nov/2017). In Memoriam pages have been created for each of them. This site hosts a significant body of LURG related material. You will find original programmes, running orders, publicity material, reviews (good and bad! ), plus facts about known performances. Also included are many performance and social photos, some previously unseen for nearly four decades. Probably most significant, are the recordings of many early shows, along with a few rehearsals. A new Kick The Squirrel page. Numerous new items from the scrapbooks (see full list). New STS, Annual Awards and Membership Lists pages. An assortment of material circa 1978 from Tim Stevens. More photos, including ten early 80s snaps from John Freeman, plus many Golden Mouldies and Ten pics. Missing Lonsdale refectory (1978) performance added. Improved show audio quality. Also, Left Handed Screwdriver Show audio fixed/updated. Ex-members can actively participate in the site. Many pages include information contribution forms and registered members can comment on much of the site's content. There are still many gaps to be filled in the historical content, as detailed on the Wanted! and Unanswered Questions pages. Former members are strongly encouraged to contribute missing information, photos, memorabilia, documents or recordings. If you have information about LURG related events or news, pass them on, so they can be posted here.